German composer Karlheinz Stockhausen's epic Licht cycle is to be staged in its entirety for the first time. The European Centre for the Arts Hellerau in Dresden will stage the 29-hour piece in 2008 to coincide with Stockhausen's 80th birthday. 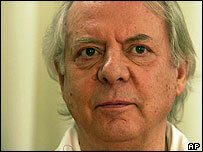 He began composing the work - one of the most ambitious of its kind - in 1977 and finished it in 2002. Five of the piece's seven parts have already been staged separately between 1981 and 1996. Stockhausen, who was born in Cologne in 1928, wrote Licht in seven parts, each taking its name from a day of the week. Pieces based on five of the days have already been staged separately in La Scala, Milan, and in Leipzig. The closing scene, Licht-Bilder (Light Pictures) from the final Sonntag aus Licht (Sunday from Light) was completed on 31 December 2002. It is scheduled to have its world premiere on 16 October at this year's Donaueschingen Music Festival. Udo Zimmermann, chairman of Hellerau's festival theatre, said the staging of the seven parts would cost 10 million euro (£6.89m). He said the search was now on to find sponsors.